I haven’t blogged about my running in months. Partly because there wasn’t much to say, and partly because I’ve just been plodding along. I ran my first 21km for 2016 today, and got my first medal for the year. It wasn’t my first race though… we got a water bottle at the last race. 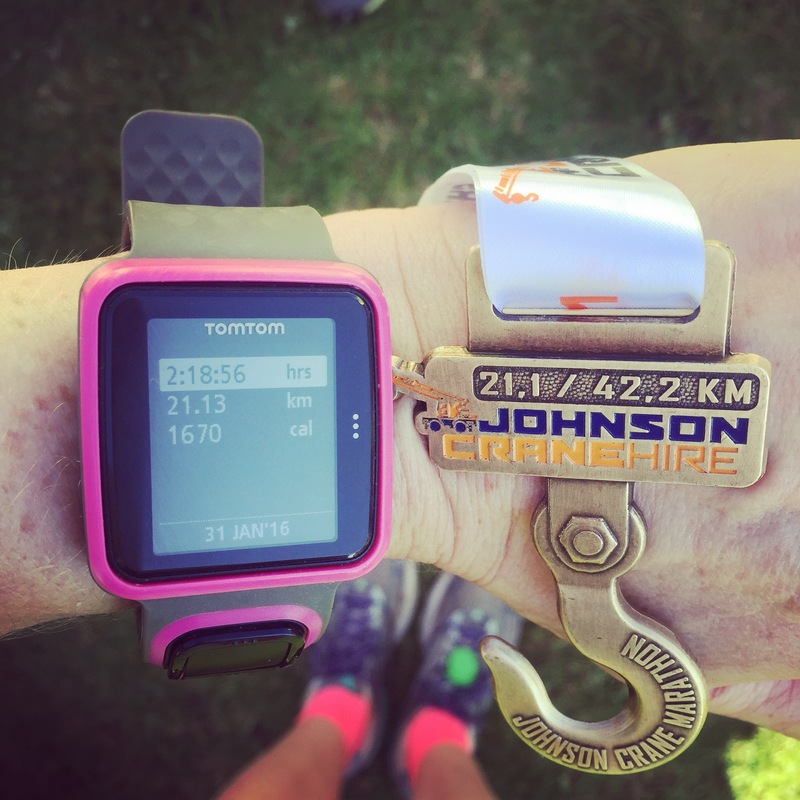 It was the Johnson Crane marathon in Benoni today. And it was the first time I’ve done it… and the route was new anyway, so everyone was in a similar boat and hadn’t run it before. It was very flat. Very flat. I was actually praying for a proper hill towards the end so that there’d be a downhill to coast on. It’s hard work with a long flat race, there’s just NO opportunity to relax at all. The parking was a disaster… the traffic jams to get in and leave to go home were insane. Other than that LOVED the race. 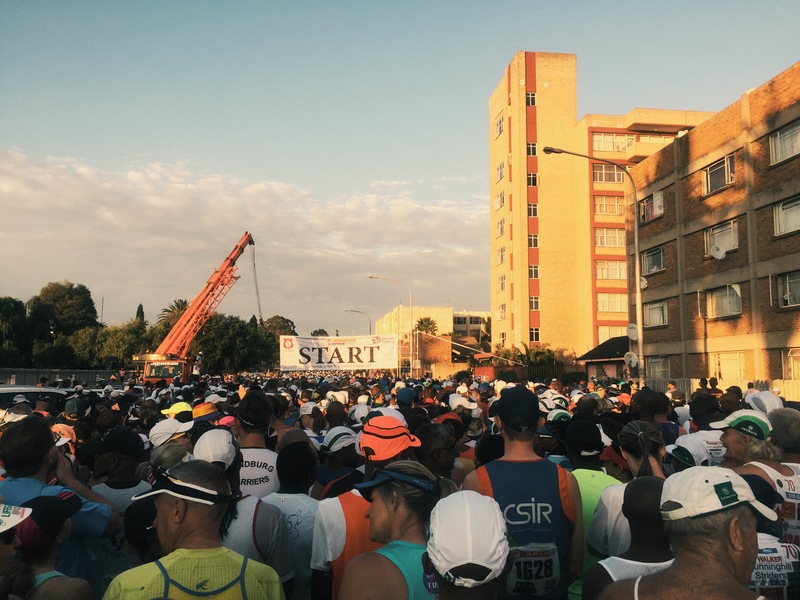 The marshalls were amazing, and hats off to EMPD who had to deal with very irate motorists on the route. The water points were outstanding!! Although a friend who ran the 42, said that the water had run out at the last points by the time she ran through them. And it was HOT… so water was essential. 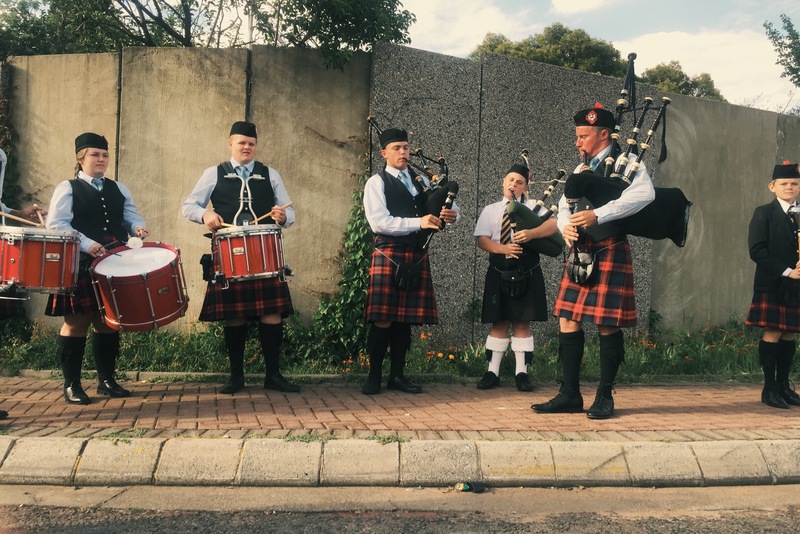 Loved the bag pipe bands that were playing along the route. Anyway, as for my race, I didn’t set out to do a PB. I’m running another 21km in 2 weeks time, so my aim was to take it easy and enjoy it. Well, I got to 15km, and thought I may have a chance to finish under 2h20. Then I got to 18km, and knew that if I just ran at the same pace without stopping at all, I’d make it… and I did! I’m so very pleased with myself. I’ve finally got below the 2h20 barrier. So now, the question is, what to do… before this race, I was seriously contemplating running a marathon this year. Just one. Just to say that I’ve done it. But I’m shattered again, it’s taken me the entire day to feel human again, and I still have a headache that I can’t shake. I’m sure I could run further, but a whole other 21km? That sounds highly improbable. I was watching people finish the marathon today… not sure I want to put myself through that. And mostly not sure I want to be on the road for 6 hours!! I’m definitely not fast enough to do it under 5hrs like my friends are doing. So I’m really undecided now… but erring on the side of no. I think I’ll stick to 21s for a long while to come. What an awesome time! Well done! And a PB! WHOHOOOO! Johnson Crane was my very first half marathon so I always return but after today, I doubt I will. It’s tough! Way too flat! But agreed, the organisation was fantastic. I dunno. I think you’d be fine to do a full marathon. It’s all in the head (so they say)! Well done on that new PB! Personally I decided to ‘specialise’ on shorter distances. Mostly 10s, some 15s and a few 21s and then work on speed. The time needed for training is the one thing that’s really putting me off… that and being on the road for 5-6 hours during a race!! That’s the entire day gone.